CarGurus has 48,746 nationwide Malibu listings starting at $1,000. Chevrolet’s engineers deserve credit for steering that’s tight and sporty at high speeds while demanding little effort at slow speeds and when attempting to park. Chevy continues to bounce back from a federal bailout—and decades of building second-rate sedans—with a string of new and thoroughly revamped models that are legitimately worthy of attention by more than just the Bowtie-brand faithful. 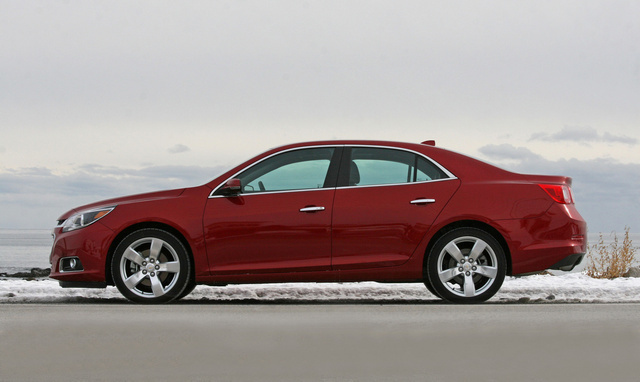 One example is the 2014 Malibu, an efficient 4-door promising enviable levels of comfort, technology and performance. 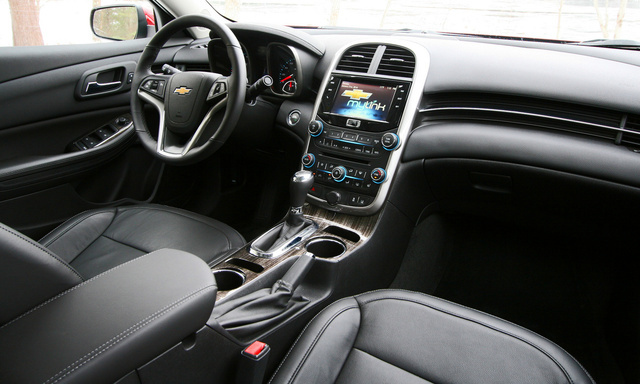 While it hasn’t been overhauled to the extent of 2014 models like the Impala and Silverado, the Chevrolet Malibu sedan does sport a restyled front clip, redesigned center console and additional rear-seat knee room, not to mention numerous upgrades throughout the car and, specifically, under the hood. More on that in a minute. First, let’s take a look at the 2014 Malibu’s various trim levels. Starting things off is the entry-level LS, priced from just a tick over $22,000 and equipped with 16-inch alloy wheels, Bluetooth connectivity, OnStar, a height-adjustable driver’s seat and cruise control. Next is the $23,610 Malibu 1LT, offered with standard Ice Blue accent lighting on the dash and doors (similar to what you’ll find in the Impala and Buick models), the Chevrolet MyLink 7-inch touchscreen infotainment system with satellite radio service and voice-recognition technology, heated mirrors and a set of floor mats. Starting at about $25,300, the 2014 Malibu 2LT moves a bit more upscale courtesy of dual-zone automatic climate control, a remote-start system, leather-wrapped steering wheel, driver’s power lumbar adjustment and 18-inch alloys. An available 3LT trim level is essentially a 2LT with a more powerful standard engine that increases the sticker price to $26,850. The $27,790 1LTZ is the premium-grade Malibu, as evidenced by its leather upholstery, unique alloy wheels, auto-dimming rear-view mirror and heated 8-way power-adjustable front seats. 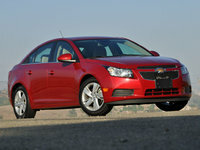 A 2LTZ model, starting at $29,950, includes a power moonroof and the upgraded engine. 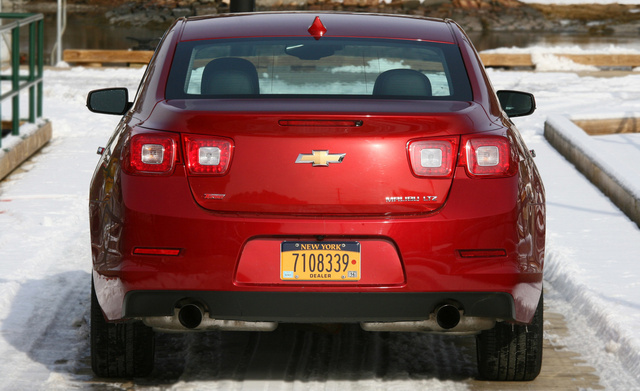 For this review, Chevy supplied me with a heavily optioned Malibu 2LTZ carrying a sticker price of $35,105. That sum reflected an $825 destination charge as well as a $795 navigation system, $395 for Crystal Red Tintcoat paint, an $890 Advanced Safety Package, a $1,000 LTZ Premium Package boasting HID headlights and push-button start, and a $1,350 Electronics & Entertainment Package consisting of 19-inch alloys, a 250-watt Pioneer stereo, a rear-view camera and more. Unlike many of its competitors, which at least offer all-wheel drive (AWD) as an option, the 2014 Malibu is strictly a front-driver, but it does follow an increasingly common script that includes no mention of a V6 and instead calls for the use of two distinct 4-cylinder powerplants. 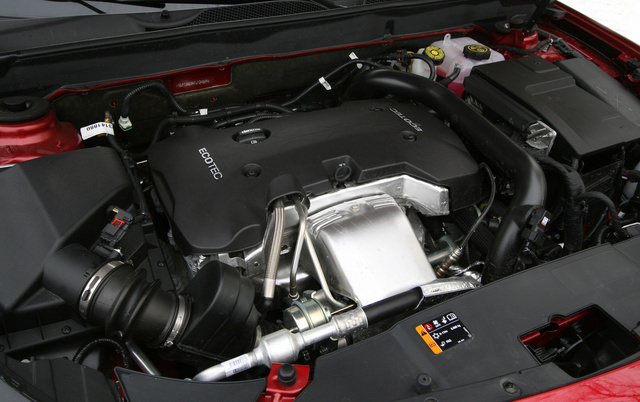 The base engine is a direct-injected 2.5-liter 4-banger that’s good for generous output measuring 196 horsepower and 191 lb-ft of torque. A 6-speed automatic transmission is standard. According to the EPA, drivers can expect to average 25 mpg around town and up to 36 on the highway, thanks in part to a standard start/stop mode that shuts the engine down at stoplights, for example, only to refire after a couple of minutes or when the driver releases the brake pedal. You won’t find that technology in models like my 2014 Malibu 2LTZ, though what’s offered in trade should put a smile on the face of any sedan-driving enthusiast. In place of the naturally aspirated 2.5-liter engine is a turbocharged and direct-injected 2.0-liter 4-cylinder boasting 259 hp and 295 lb-ft of torque. Again, the 6-speed gearbox is standard, and it contributes to fuel-economy ratings of 21 mpg around town and 30 on the highway. I averaged 22.8, somewhat disappointing since the majority of my time spent behind the wheel was on Interstate 95 and secondary roads. It’s worth noting that Chevy recommends filling the tank with premium-grade gas, though that’s not a requirement. For those who have long known the Malibu as a ho-hum 4-door catering to the librarian and nun crowds, the idea of a boosted variant may seem a bit curious to say the least. However, I found this Chevy to be well sorted and, to my own surprise, a genuinely fun ride. The 2.0-liter feels and sounds refined, and it delivers impressive acceleration, with only a smidge of turbo lag entering the picture when the gas pedal is pinned to the floor from a dead stop, after which the front tires light up for a second or two and the car starts hauling tail. Bothersome torque-steer isn’t part of the equation. Sadly, the transmission lacks a sport mode, though there are the typical GM +/- shift buttons on top of the gear lever. I’d prefer the more typical setup that allows a driver to click the knob to the left and tap fore/aft to manually shift, yet I expect few Malibu owners will seek out this feature anyway, regardless of how it’s presented. That said, I did use it while traveling on a snowy day to slow down without using the brakes, and it helped me maintain control on some slick roads that were dispatching more than a few trucks and AWD crossovers. Any trepidation I had about tackling a New England blizzard in a front-wheel-drive sedan was silenced by my test car’s sure-footedness. With regard to the 2014 Malibu's handling, I was equally impressed. To be clear, we’re not talking about a high-performance 4-door, but Chevrolet’s engineers deserve credit for steering that’s tight and sporty at high speeds while demanding little effort at slow speeds and when attempting to park. The same goes for a suspension system that’s taut but not jarring, and commendable for its ability to isolate the effects of some of Boston’s nastiest winter potholes from reaching the cabin. 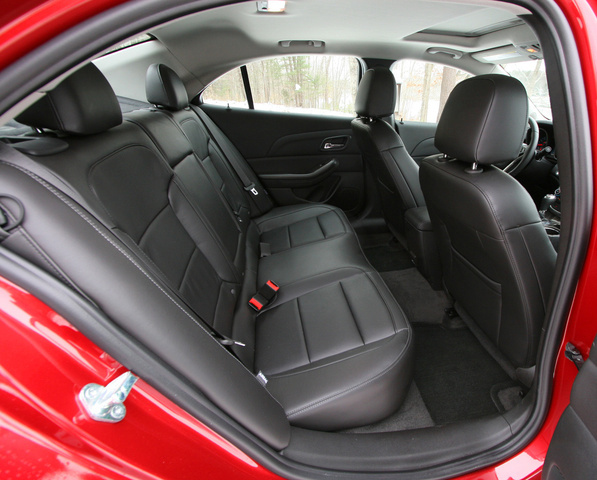 In addition to its revised styling and engine lineup, the 2014 Malibu features more rear-seat knee room than before—1.25 inches more, to be exact. For me and my 5-foot, 8-inch frame, that translates to plenty of space. Access is aided by doors that open wide, and once inside, passengers will find the bench offers sufficient support and a comfortable recline angle. Up front are triple-setting heated buckets that prove to be even more inviting with their ample side bolsters and appropriately firm cushions. The seats are accompanied by a manual tilt-and-telescoping leather-wrapped steering wheel for the driver, as well as padding on the center armrest and door sills. The use of soft-touch materials carries over to the top of the dash, relegating hard plastics to less-obvious areas of the cabin, including the lower instrument panel. Overhead is a mesh material that also covers the visors, while tactilely pleasing rubber grips have been fitted to the primary control dials. Fake woodgrain panels are found inside the 2014 Malibu 2LTZ, too, though contrary to what you might think, they don’t cheapen the interior. Another factor likely important to prospective Malibu buyers—those who will use the car as a grocery getter, mobile office or family road-trip rig—is storage. 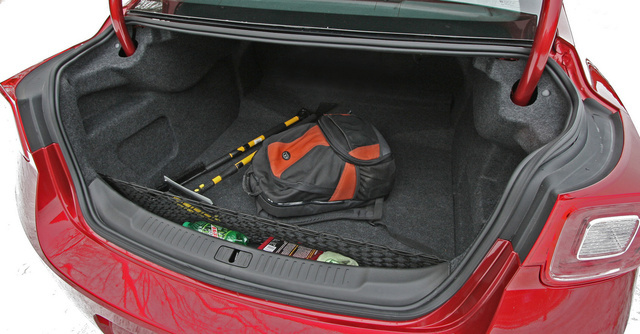 Designers have addressed that concern with a broad 16.3-cubic-foot trunk, a rear split-folding seat that increases usable cargo space, several cupholders and slots for smaller items like phones and parking cards, a large cubby located by the driver’s knee, a three-prong 120-volt outlet (handy for charging kids’ DVD players and portable game devices) and a spacious glovebox. At first glance, the 2014 Chevrolet Malibu may not strike you as a hotbed of technology, but in reality, this family-friendly sedan offers many of the items that are increasingly becoming must-haves. Among them is the touchscreen MyLink infotainment system, which includes the ability to read and respond to incoming text messages and an iPhone-specific Eyes Free mode that uses the steering-wheel-mounted voice-activation button and Apple’s Siri software to make phone calls, select a stored song, change radio stations and more. Of course, popular apps such as Pandora and Stitcher are also incorporated into the package. Thankfully, the entire setup is extremely easy to use, even for those of us who are a few terabytes shy of being completely tech-savvy. As I discovered, pairing a phone is quick and simple, the screen doesn’t wash out in daylight, icons are bright and intuitive, and with a USB port and power outlet located within the center armrest, your smartphone or MP3 player is hidden away. There’s also a storage compartment behind the center screen that’s useful for keeping a wallet or other small valuables out of view. On the outer edges of the screen are haptic buttons. Honestly, my previous experiences have soured me on this modern alternative to the old-fashioned variety—you know, those that move when you touch them—but the Malibu’s seemed to be more responsive than others I’ve tested. Or, perhaps, I’m finally adjusting to this new-fangled gadgetry. One thing I’ll never get used to is receiving incorrect directions from a car’s navigation system. Unfortunately, that’s exactly what the Malibu delivered when I was traveling out of town on a day when snow was falling hard and sideways. For whatever reason, I was pointed to the wrong part of the right town; when I entered the same destination into my iPhone Maps app, I was provided proper guidance. If I’d thought of it, a better solution would’ve been to take advantage of the OnStar Directions & Connections feature (complimentary for the first 6 months of ownership), which would have linked me to a live operator who could download the route (presumably the right one) directly to my car. A plethora of comfort and convenience features certainly make a vehicle more appealing, especially for anyone who spends a good bit of their day commuting, yet they don’t amount to much if the car they’re in doesn’t deliver on the safety front. For the 2014 Malibu, that’s not an issue, as Chevy’s midsize sedan earned an overall 5-star rating from the National Highway Traffic Safety Association (NHTSA) and a best-possible Good ranking in all tests conducted by the Insurance Institute for Highway Safety (IIHS). Much of the credit goes to the Malibu’s construction, as well as its 10 standard airbags, as well as available rear-side airbags, side blind-zone alert, a rear-view camera, rear cross-traffic alert and lane-departure warning system. The 2LTZ I tested also included forward-collision warning, utilizing an effective yet not alarming combination of dash-top red lights and audible beeps to let me know that an unscheduled meet-and-greet with the car ahead could be imminent. Just weeks before testing the 2014 Malibu 2LTZ, I spent a week evaluating a 2014 Chevy Impala. Neither is available with an AWD system, which I think detracts from their desirability in areas where the weather can get foul and the roads sketchy, like here in northern New England. And to some, the lack of a hybrid variant (the eAssist-equipped Malibu Eco was discontinued in late 2013) might be a turnoff, considering all the Malibu’s main competitors offer this option. However, in many value-related respects, the 2014 Malibu makes a sound case. Granted, its projected resale values are a few percentage points below those of its rivals, but it’s right there in the hunt in terms of base price, and it comes with free factory-scheduled maintenance for 2 years or 24,000 miles. Plus, J.D. Power and Associates has awarded the 2014 model an above-average rating for quality and predicted reliability, and the standard 2.5-liter 4-cylinder engine delivers some of the best fuel economy in the class. Those who opt for the Malibu’s optional engine will be working with an extra 55 hp compared to the Ford Fusion’s 2.0-liter EcoBoost, 21 more than the Hyundai Sonata’s turbocharged 2.0-liter and 27 more than the Toyota Camry’s available 3.5-liter V6. 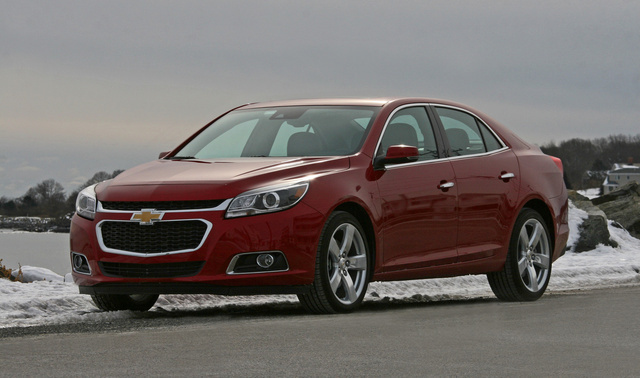 What's your take on the 2014 Chevrolet Malibu? 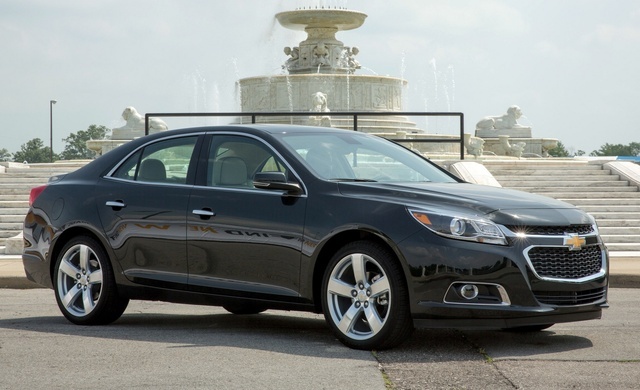 Users ranked 2014 Chevrolet Malibu against other cars which they drove/owned. Each ranking was based on 9 categories. Here is the summary of top rankings. Have you driven a 2014 Chevrolet Malibu? I have a 2014 Chevy Malibu in the anti theft deterrent system is on will not let me start the car how do you fix this problem? I had O Reilly’s check for codes since my engine light came they said no codes came up so what could be wrong with my car? I tried to start my car this morning my theft deterrent light is on I tried to unplug the battery left key in ignition. Please help. I have a 2014 Chevy Malibu. I hit a curb a few months ago and now have this hanging for the front bumper underneath and dragging. Everything on the car is working normal. Any ideas what this is?